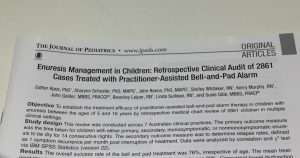 This clinical research audit has now been published in the Journal of Pediatrics and supports the treatment efficacy of the practitioner assisted bell and pad Ramsey Coote system. 76% success rate irrespective of age within 6-8weeks. It is very important to understand the base line treatment and be able to assist as many children as possible in becoming dry at night. Contact us on info@ramseycoote.com.au for more information on our products and help in establishing a successful practice.